In September last year Uber's new boss came to London at a moment of crisis with its licence to operate in the city under threat. Today Dara Khosrowshahi was back with a scheme he says heralds a new partnership with London. But how the plan to make the entire Uber fleet in the capital electric by 2025 will be greeted depends on where you stand on a company that has proved very divisive. 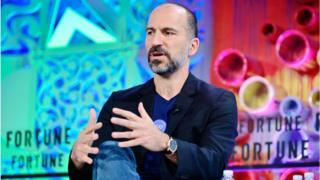 Its fans will welcome a move which Mr Khosrowshahi says is part of a grand strategy to make transport cleaner and safer. Its detractors will say the scheme - funded by a 15p per mile increase to the fare on every journey - is just a hidden price rise with scant chance of helping drivers or cutting air pollution. In a wide-ranging press conference, the Uber boss, who has a more conciliatory approach than his predecessor Travis Kalanick, stressed his determination to act like a "strong local partner" with the regulator Transport for London, tackling an air pollution problem that affects every major city in the world. I put it to him that Uber's 40,000 cars were a major contributor to pollution and congestion in the city. He said most of them were hybrids, and anyway, all vehicles contributed equally to congestion. He was hostile to the idea of a cap on Uber cars, floated by Mayor Sadiq Khan, preferring a congestion charge on everybody including private hire vehicles and black cabs: "It's fair to charge everyone equally - all the vehicles are taking space on the road." The plan to get half of Uber drivers to go electric by 2021, with all of them converted by 2025, looks very ambitious. The average driver on the road for forty hours a week will build up £4,500 from the clean air levy over three years - but that will still leave many of them struggling to afford an electric car. By then some of them will have moved on - after all, Uber driving is often a short-term activity - and the money they have saved will just go back into the central fund. But the biggest problem is going to be charging - most drivers will not have off-street parking where they can plug in overnight, and one can imagine fleets of Ubers circling the few available charging points in central London, causing more congestion. Dara Khosrowshahi admits there is a problem with the infrastructure. "The city is going to need to invest in it and we'll need to support them." Uber's chief executive also outlined his vision of a move from a ride-sharing platform to an all-purpose mobility service, "eventually replacing car ownership itself." That includes forging ahead with its autonomous driving operation. He was cagey about reports that Uber might hive off the division which had to halt on-street trials after a fatal accident: "Our focus is to get back on the road in a safe and effective manner." Talking of safety, we also learned that Uber is using AI to monitor its drivers' performances, with its systems picking up whether a particular trip has taken a much longer or shorter time than usual. Today Mr Khosrowshahi should have been in Riyadh speaking at the Future Investment Initiative and meeting the Saudi investors who have a major stake in his company, as well as a seat on its board. He pulled out of the event amid the scandal over the killing of the journalist Jamal Khashoggi which he euphemistically referred to as "unfortunate recent activity" in which Saudi involvement had yet to be determined. He said based on what now came out about exactly what had happened and who was responsible, "we will make a determination as to our governance going forward and what our investment make-up looks like." Uber's new boss came in with a promise of a kinder, gentler approach than his predecessor. Now, from the ethics of accepting Saudi money to the impact of his business on its drivers' and passengers' wellbeing, he is tangling with a range of dilemmas more complex than he could possibly have imagined.